Augmented reality (AR) technology tends to be the type of shiny object that, like so many magpies, users collect as apps on their phones. We’re talking Snapchat World Lenses here, or Facebook Camera effects. Marginally better uses would be games like Pokemon Go. But before every Facebook, there comes a MySpace. Developers are beginning to put this technology to real world use. It might surprise you to learn that AR fishing apps have actually been around for years. 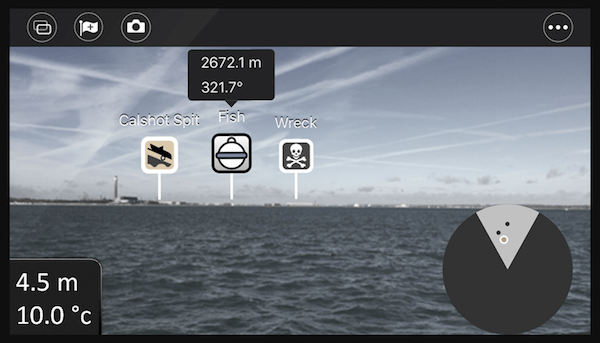 Or, to be more precise, an AR fishing app. Since 2016, Raymarine has offered a smartphone app to accompany its Dragonfly-Pro and CHIRP fish finders/sonar systems. Their Wi-Fish app connects with their devices IoT-style. Using the GPS, compass, and camera, between your phone and sonar, you can mark spots on your favorite bodies of water and view them in AR. ‘Why would I do that?’ you might ask. ‘Don’t you think I know my home lake?’ Well we’ll tell you why. The Wi-Fish app allows you to use your phone like you might use binoculars. As you scan the horizon, marked spots will appear as small icons. You can use the app to keep track of deep holes, fruitful fishing spots, wrecks and hazards to avoid, reed beds, the spot where you could have sworn you saw your local lake monster, etc. The app also saves the information you’ve collected, allowing you to go back over previous areas to review lake depth and other info. In many ways, this is downright practical. When navigating a body of water, it’s easier to be able to hold up your phone and mark your direction without taking your eyes of the water. The alternative would be using, say, some navigation app and glancing up and down in reference. Or you might be leveraging ink and paper in the process with a traditional map. Also—how many times have you tried to head out early in the morning only to find yourself completely socked in with heavy fog? This app could be of use even on very familiar bodies of water. It’s true, in many instances, you know your local lake better than your neighborhood. You don’t need any shiny AR magic to help out there. But if you frequent numerous different lakes, like to mix things up, and want to keep track of certain locations, this app is perfect. Many anglers have adopted it with a good measure of success. But it can still have its issues. Specifically, some users report some difficulty in using the software with certain connections. There’s no doubt that the app is data-heavy compared to, say, live-tweeting your fishing experience. Other reviewers have commented that software updates can crash the app. These instances appear to be exceptions. Considering that Sparky was trying to connect to WiFi and not mobile data, his case might very well be a one-off. For now, that is the extent of AR use with fishing. It does seem that the technology could have some truly beneficial uses in the sport, and we’re exciting to see where it goes in the future.